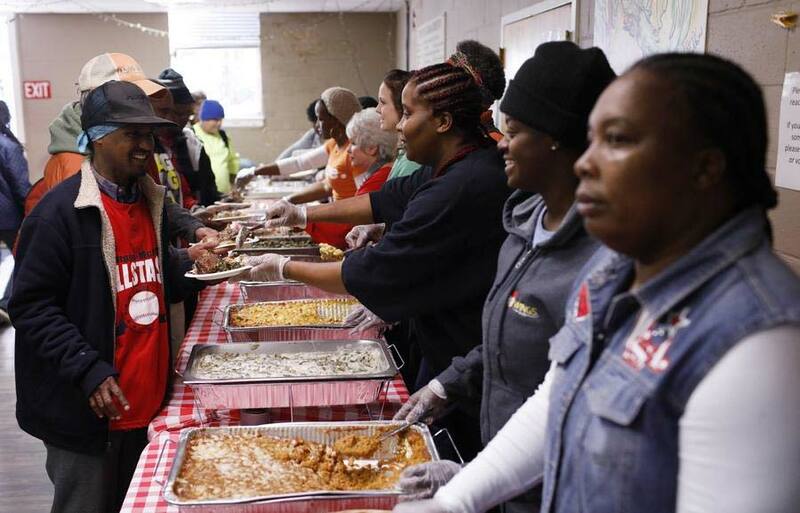 The Sparrow’s Nest hosted its annual Thanksgiving feast Wednesday with over a dozen area churches and local businesses coming together to feed over 400 members of the Athens community. Phyllis Sheats and her family organized and help put on the busy and festive event. Saucehouse BBQ cooked 40 turkeys and a slew of other food for the event. “To me, it’s the most rewarding way to spend Thanksgiving and I started doing this with Garland Bradford ( Phyllis’s brother who is also the kitchen manager at Saucehouse) four years ago and every year its made my thanksgiving,” said Saucehouse owner Christopher W. Belk. Food was brought in fresh from the Saucehouse BBQ kitchen to be served up to patrons at the annual Thanksgiving feast as community members flooded in to grab a plate full of piping hot Thanksgiving Day favorites at the Sparrow’s Nest in Athens, Ga., on Wednesday, Nov. 21, 2018. Want to see more and pictures of the event? View it here on Online Athens. Saucehouse again listed in Bulldog 100 for 2019 as one of the fastest growing businesses! Saucehouse offers the college-town vibe that Athens brings.